Announcing our giveaway winners! Special thanks to Saramonic for this amazing offer. The Grand Prize winner which is the VMIC Pro – Super Directional Condenser Video Microphone! (Value $399) goes to Craig W. from West Chester, PA.
Another super giveaway winner! Big thanks to Tokina for this fantastic offer. The Second prize which is two brand new Tokina FíRIN 20mm F2 FE AF goes to Mr. Kevin L. from Houston TX, (USA). Enjoy the lens, Kevin! And finally, Mr. David S. from Germany receives Kenko DG Extension Tube Set for Full Frame Sony E-mount mirrorless cameras. The Tokina FíRIN 20mm F2 FE AF (buy on Adorama) is an autofocus version of the existing FíRIN 20mm F2 FE MF (buy on Adorama) super wide angle lens for full-frame Sony E-mount. We’re picking out the winners of the Cinecom’s 500K subscribers contest by trowing darts arrows at 100 random names drawn by the give-away system. – All the winners are sent a personal email to the address they've entered the give-away with. Please respond within 3 days, else a new winner will be randomly drawn. – Those who have gathered over 100 points will receive a free copy of the DSLR film-making course. Please check your email in the next 2 days! Gosh how I love giving things away! I've had the pleasure of entering (and actually winning a couple) of giveaways recently and it is very fun being on the other side where y'all are! After administering so many giveaways, I finally feel the excitement of trying to win and in some cases actually winning. So thanks to the good folks at X-Rite and Tenba for this fun giveaway. Below, you'll see the video I recorded of the winner selection and the official names and quotes below that. I hope you enjoy! I am very excited to have been so fortunate to have won one of these great additions to one of my cameras. Thank you to planet5D and keep up the great services. I love planet5D.com as it is a wonderful source for video/filmmaking. There's so many descriptive posts that help me make choices on how to film my videos. If it weren't for planet5D.com I would be clueless on most of the work I do. I am absolutely excited to find out that I am a winner of their April 2018 Xrite/Tenba giveaway! Thank you planet5D Xrite and Tenba for making me a winner of this wonderful giveaway!! You can also find X-Rite and Tenba on Adorama. Tenba Cinelux bags were designed to address major needs that filmmakers told us were being unmet by their current bags. The Cinelux is designed to hold everything from 4k mirrorless cameras to a cine rig with accessories attached, ready to shoot. The doctor-bag opening allows unmatched speed by providing unobstructed access to your gear through a single zipper and wide opening allowing cameras to be stored fully assembled cutting down on setup and breakdown time. Erin M from New York was our winner from the MeVIDEO giveaway. This is amazing, thank you so much! My son has begun taking visual arts classes and he is going to go crazy for this, it will be such a help to him both in school and out. Hopefully this will inspire him to do more with what he has learned so far. Thank you so much planet5D for such amazing products and generous giveaways! We want MeVIDEO to be a brand that values the look and feel of a product as much as its features and functionality. From its sleek aluminum finish to all the features packed into this tripod, we’re pretty sure you’ll be happy with the way it looks just as much as the footage you shoot with it. More info on Kickstarter page. The side panels of the video head are made with aluminum castings. These are made by pouring molten aluminum into the mold. The spider of the tripod is forged which is produced under great pressure which results in great strength. Parts of the tripod are dull polished to give them a brushed aluminum accent. Available in both Black and Titanium, each machined aluminum part is coated with an anodized finish which provides the product with a layer of protection. With a simple untwist and twist, you can combine the leg and center column to form a monopod. A leveling base is attached to the top of the center column making it easy to quickly level the head independently of the tripod. The video head can be removed and used on other flat surfaces such as certain sliders, jibs, half ball adapters and more. You can also mount another head with a 3/8″-16 thread. The center column can be used as a long column for additional height and short column for low to the ground shots. We had an awesome giveaway from Benro and I thank them for their prizes – and hopefully you thank them too. I apologize for forgetting to post this right away. I recorded the winning video but then forgot to post. I certainly appreciate the support from Benro and the Mac Group! I found this tutorial featuring the Benro Aero 7 (one of which we gave away) from our friends over at Cinecom.net… Check Benro's Aero site! Super excited to win! I’ve been shooting with my Joby Tripod for the longest time but really needed to invest the money into a real quality tripod, now I don’t have to. Thanks Planet5D and Benro! When I selected the winner after the giveaway closed, I recorded this video. Some have asked if I could do it live, but I don't think I should as the winner's full name and email address would be visible and I don't have permission to post those. We had an awesome giveaway from Tenba who was giving away 3 of their brand new Tenba Roadie bags! I got a chance to see these Tenba Roadie bags at NAB and they are STRONG as well as versatile. And did you see the Sumo guy in their video? Check their site! I am so excited to win a Tenba Roadie — I've had my fingers (and toes) crossed since entering the giveaway! Thank you so much! I am excited to use this high-quality roadie in all my travels. I know that it will last a very long time and I look forward to putting it to good use!! Thank you to planet5D and Tenba for holding this giveaway! Thanks too, planet5D, for helping me make some gear choices a couple of years ago while continuing to be a great place to keep up with the latest news and reviews. I look forward to making good use of the roller when traveling here in the US or overseas. Thanks again!! When I selected the winner Sunday evening after the giveaway closed, I recorded this video. Some have asked if I could do it live, but I don't think I should as the winner's full name and email address would be visible and I don't have permission to post those. Our first (of hopefully many) giveaway for Sekonic. With several industry firsts, sophisticated features, and 2.7′ color touch screen, the all-new L-858D-U provides content creators with the critical exposure data they need to create stunning and beautiful imagery for still or motion. Check their site! The first winner hasn't responded yet – looks like we're going to be selecting someone else soon – good for you all! I absolutely love planet5D! It's got all the hottest gear and great writeups about new products, it's my go to site for reading about the Canon Mark line! The imagery on the site is stunning! Sometimes I just like looking at the images to get new ideas on how I can stay competitive in the industry. planet5D has always been a source of timely and relevant information for me – one of my favorite industry blogs on the net. I'm so glad I entered to win this contest as I REALLY wanted this new light meter. I still own a Sekonic from my college days, almost 20 years ago, and it still works like new. I'm so glad that I'll be able to add their latest feature-rich light meter to my camera bag, and I'm sure it will be an important part of my workflow on set for capturing the highest quality images. A great big thanks to planet5D and Sekonic – I'm a big fan of both! You both rock! Sekonic L-858D-U Speedmaster Light Meter Full Technical Specifications HERE. Our first (of hopefully many) giveaway for Stella. They have some awesome lighting solutions for filmmakers and photographers as well as other kinds of lighting. Check their site! Rugged, compact Single-point LED – waterproof to depth of 328 feet. Will withstand a drop from height of 3.3 feet. Light – at just .5 lb with an integrated battery, the Stella 1000 sets a new standard for power and portability. Huge thanks to planet5D for not only having these prizes but mainly for the information shared on its website. Very useful and it helps keeping up with all industry news. Lights that can survive and are portable! Have a look at what my fried Barry Andersson has to say about these Stella lights! So RØDE was the sponsor of our most recent giveaway. Our thanks to them of course! Jacqueline was the winner and will be donating it to her church! Learn more about the RØDELink Click HERE . Learn more about RØDE VideoMicro Click HERE . So Syrp was the sponsor of our most recent giveaway. Our thanks to them of course! This was our second giveaway for them and we're planning on several more so if you didn't win this one, be on the lookout for the next! I am really excited to have won this wonderful prize. I would be able to do wonders with my videos using these syrp equipment. I would like to thank planet5D for their cool stuff and offers! I m very excited to be selected as a winner in the June 2016 Syrup giveaway. The prize fits in very well, as I am very much into Astro Photograhy and Astro Timelapse work along with Panorama images. I am sure I will put the item to good use and thank the sponsors for providing the prizes. The Magic Carpet is a simple, durable slider for silky smooth professional tracking movements. The Magic Carpet is ‘Genie friendly’ and includes everything you need to quickly add full motion control. Learn more about the Syrp Magic Carpet here. Motion Control in your pocket! The Genie Mini is an extremely easy-to-use device to create smooth panning motion time-lapse or real-time video. Wirelessly connect to the Genie Min using the Syrp Genie App for quick setup and simple control. Learn more about the Genie Mini here. We were excited to be able to offer 2 Sachtler Ace M Tripods and a Lightpanels Caliber! Learn more about Litepanels Caliber Kit Click HERE. Learn more about Sachler Ace M Tripods Click HERE. We were excited to be able to offer 7 Musicbed music gift certificates for $100 each! “What could be better than launching your email app and reading another edition of the planet5D blog? I know… you are saying “Nothing is better than that!” But you are wrong, because opening it and seeing an email from planetMitch telling you you won free stuff from planet5D and a cool sponsor is even better! Seriously though, I've been enjoying the always informative and entertaining planet5D blog newsletter and website for several years. Winning $100 in Musicbed credit is just icing on the cake. Thanks Musicbed and planetMitch! My name is Raymond and i am so happy to be able to tell you about how excited i am to have win this giveaway from planet5D. Its hard to put into words what this wining Musicbed giveaway on planet5D can do for a person who sometime thinks that giveaway are just put out there to get people hopes up. I can never say a off about the great things the happen on facebook. I just love planet5D for putting this giveaway and so much more out there for people to read. The more a person knows the better the world becomes. Thank You!! I am super stoked to have won one of these Music Bed gift cards! Its really great that planet5D partners with companies like Musicbed to do neat giveaways like this. It definently builds the film and music community. As a filmmaker I have used Musicbed a number of times. It is really great that they enable Filmmakers like myself to have access to professional music and soundtracks that would normally cost a couple grand to either license or otherwise have custom scored. At the same time it enables real musicians to get their work out there and make a profit off of their tracks. planet5D is a great place to also see new gear plus the blogs help filmmakers see new perspectives on filmmaking, enabling more creativity. I think more filmmakers need to know about companies like Musicbed, so I think its great that planet5D is able to both collaborate and get these names out there! My thanks to planet5D and MusicBed for allowing me the opportunity to win! These are my go-to sites for the latest news, cameras, equipment, reviews and music and more! They provide with up-to-date information and content whenever I need it, allowing me to expand my knowledge in the photo and video industry, giving me the power to create better content. Thanks again! I am thrilled to have won the Musicbed giveaway on planet5D! The licensing service that Musicbed offers is exactly what I need to give my current project a boost. Thanks planet5D, you're awesome! Hi everyone! I'm Martí, an amateur filmmaker from Barcelona, and today I realized I won the awesome Speedlooks giveaway! I'd like to thank both planet5D and Looklabs for this giveaway, it's people like them that have helped me (and still do) to improve my low-budget films. About a year ago i bought a Panasonic Lumix GH4 after reading some postst from planet5D (and some other sites as well), watching reviews and tests, and all that kind of stuff. For someone like me who can't afford a film school it's great to be able to have websites like planet5D that teach all kind of stuff around mirrorless and DSLR filmmaking, and now this Speedlooks pack will make it much easier for me to color grade my shots. Thanks again and I wish the best luck to everyone who participates in any other giveaway! My name is Shawn Im an actor and a film maker I cant believe i won i usually don't win these types of things at all, That comes to show that you should enter when you have a chance to enter a giveaway. I'm literally on planet5D all the time checking out the latest news, ideas and inventions when it comes to film making they are always on their game when it comes to that. They are a big help to Indie film makers like my self. I cant wait I'm just super excited to use the give away prizes..Planet5D rocks. Thanks. Learn more about the Genie here. Learn more about the Genie Mini here. Learn more about the Magic Carpet here. Andrea P. from Italy chose the Syrp Genie and Tim D. from Germany chose the Genie Mini. A.J. from Texas USA received the Syrp Magic Carpet Slider. Syrp has committed to doing 3 more giveaways this year – one per quarter! So keep an eye out for those announcements in June, September, and December! We selected 2 winners and they've both accepted the terms – so congratulations go out to Hélder and Alex! 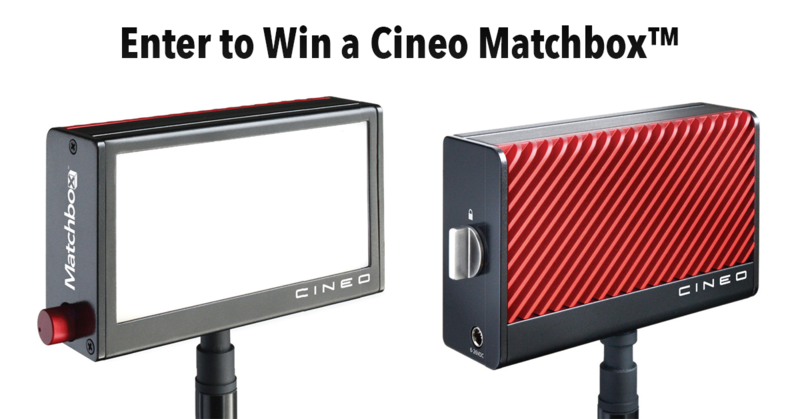 So make sure you keep an eye on Cineo Lighting's website – they have some great products and we sure appreciate the opportunity to give 2 away!